Whether G20 countries embrace responsible climate policy is of critical importance, since together they account for roughly 80 percent of global greenhouse gas emissions and 80 percent of global GDP. German Chancellor Angela Merkel has announced responsible climate policy as a goal of this year’s G20 Summit in July. In the lead up to the Summit, WRI researchers will take a close look at G20 countries’ progress toward meeting their targets under the Paris Agreement as part of our G20 Climate Progress blog series. China recently released its first climate change update report, indicating progress made toward its 2020 climate goals, which the country originally set in 2010. The Biennial Update Report (BUR) indicates that of its four goals, China has already exceeded one, is close to meeting another, and is more than halfway toward achieving the remaining two. This is encouraging progress from the world’s largest emitter. The BUR also sets new goals to tackle non-CO2 emissions, building on better, more transparent greenhouse gas data. 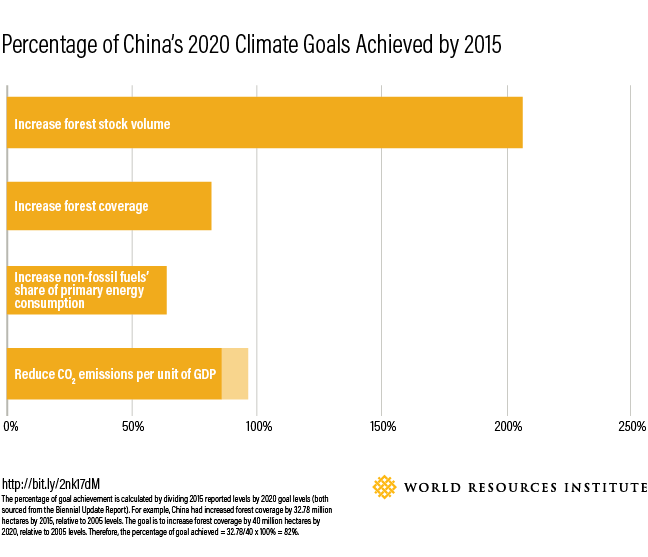 China’s 2020 climate goals include: reducing carbon dioxide (CO2) emissions per unit of GDP (known as carbon intensity) by 40 to 45 percent below 2005 levels; increasing the share of non-fossil fuels in primary energy consumption to around 15 percent (from 9.4 percent in 2010); increasing forest stock volume by 1.3 billion cubic meters; and increasing forest coverage by 40 million hectares relative to 2005 levels, an area twice the size of Uganda. The report shows that China increased its forest stock volume by 2.68 billion cubic meters in the last 10 years, exceeding its goal. The country has also achieved up to 97 percent its carbon intensity reduction goal, and the remaining two goals are more than 60 percent achieved. This is encouraging given that the country is only halfway through its goal implementation period. The country is also advancing on its 2030 goals, showing more than 40 percent progress toward its emissions intensity, forest stock volume, and clean energy goals, despite being only a quarter of the way through the implementation period. China has made this progress by decreasing its reliance on coal, increasing investments in clean energy, and shifting its economy away from heavy industry and toward services, among other actions. Moreover, some studies predict that China will exceed both its energy intensity and clean energy goals by 2020 and peak its carbon emissions by 2025, five years ahead of its international commitment. China’s BUR presents a more recent and complete greenhouse gas inventory than ever before, using robust methodologies and calculating emissions for 2012. The country’s previous inventory only reported emissions for 2005. The country also reported 18 sources of emissions that were not previously quantified, 13 of which relate to non-CO2 emissions. China has also committed to recalculating and updating its previous inventories to ensure better consistency and comparability. The country’s BUR also set new goals to reduce non-CO2 emissions. In 2012, these gases comprised 18 percent of China’s total inventory, exceeding the annual emissions of Japan. Reducing non-CO2 emissions is important, as these gases generally trap more heat in the atmosphere and have greater short-term impacts than CO2. China aims to peak methane emissions from energy activities and peak nitrous oxide emissions from industrial and cropland activities by 2020. The majority of the country’s energy-related methane comes from coal mining, while nitrous oxide emissions from industrial and cropland activities are mainly due to chemical production and use of synthetic fertilizers, respectively. China’s three new goals align closely with recommendations from a recent WRI analysis. This study found that these are some of the key emissions sources that need to be tackled. Moreover, by scaling up available technologies, China could reduce non-CO2 emissions from these three sources by more than 1.1 billion metric tonnes of CO2 equivalent by 2030—more than Canada’s total annual GHG emissions. More broadly, the study recommended that China take a four-step approach to curb its non-CO2 emissions: first, develop a comprehensive understanding of these emissions and then set source-specific reduction targets, based on more complete and accurate data. Over time, these targets can be scaled up to sector-level emissions-reduction goals, and ultimately, economy-wide GHG targets. China is already taking action on the first two steps and is well-positioned to continue on this path, making non-CO2 emissions an integral part of long-term planning. Like all countries, China’s BUR will be subject to review as part of a UN process as known as International Consultation and Analysis. The process aims to enhance the transparency of countries’ reported mitigation actions and build capacity to produce better-quality reports. With its first BUR, China is already demonstrating global leadership by releasing better data, highlighting progress toward targets, and setting new goals—all of which provide the foundation to take more action. All countries—China included—need to continually ramp up ambition if we are to tackle the global climate change challenge and prevent escalating impacts.